Description: A westbound with a Btc Cab approaches Salem. Description: PCC Car going around the loop at Mattapan. Description: A PCC goes around the loop at Ashmont Station. 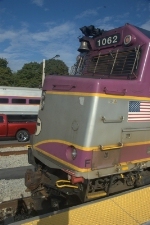 Description: An MBTA commuter train sits at Forge Park before heading back to Boston. Description: An unrebuilt F40PH pushes its train into North Station. Description: The 10:16 has just arrived from Boston. Description: HHP-8 # 650 is in charge of this westbound.